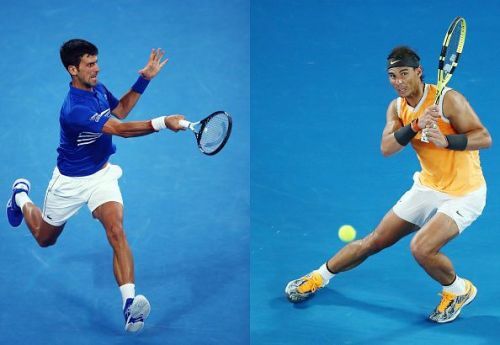 History will be on the line when the two gladiators of our sport, Novak Djokovic and Rafael Nadal, face off against each other in the final of the 2019 Australian Open 2019 on Sunday at Melbourne Park. It is only fitting that the Australian Open crown will be decided between the current World No. 1 and World No. 2. This is going to be the 53rd meeting between the two, with Djokovic leading the head-to-head 27-25. A lot is riding on the outcome of the this match for both the players. If Nadal wins, he will become the only man in the Open Era to have won every Grand Slam at least twice. Also, his overall tally of Grand Slams will become 18, within touching distance of Roger Federer's 20, which should be an added incentive for him to win the title. It's simply astonishing to see the level at which Nadal is playing in this tournament given the fact that he did not play a single match since US Open 2018 before arriving here at Melbourne Park. Nadal is yet to drop a set. He is serving incredibly well in this tournament and has been able to keep the points short with his new service motion. The one two punch is working well for him so far, and would be a key factor against Djokovic on Sunday. On the other hand, the Serb is seeking a record 7th Australian Open title. Djokovic has a special connection, almost like a love affair, with Rod Laver Arena. This is where it all began for him, when he won his first Grand Slam title way back in 2008 by beating Jo-Wilfred Tsonga. Djokovic's record here in the finals is simply staggering. He has played six finals here and is still undefeated. If he manages to capture the title agains on Sunday, he will become the man with the most Australian Open trophies (currently he is tied with Federer and Roy Emerson, each having six titles to their name). Let's look at the history between these two giants of the game. This is the most prolific rivalry in tennis history. The two have played 52 matches against each other, the most between any two players and an Open Era record. This is going to be the 53rd episode of their rivalry. They both know each other extremely well. Djokovic has a slight edge over Nadal and leads their head-to-head 27-25, but when it comes to Grand Slam finals, Nadal leads by a narrow margin of 4-3. The last time they faced off here in Melbourne Park was in the final of 2012, Djokovic winning that match in five sets which lasted for almost six hours. If that match is anything to go by, we are assured of yet another fabulous final tomorrow. Let's look at how they both got here. Quarterfinal: Djokovic defeated Nishikori 6-1 4-1 Ret. The first set is going to be very crucial in the outcome of this match. Whoever wins the first set will gain a massive psychological advantage. Also, it will be very interesting to see how Djokovic copes with Nadal's new improved service motion and one-two punches. Djokovic, as we all know, is the best returner in the game, and also the best retriever (on hardcourts). Nadal would look to get in a high first serve percentage, and also try to keep the points short. All in all, this is an extremely intriguing encounter, and one for the history books. No matter who wins, history would be created either way. Let's just sit back, relax and enjoy this epic battle!